The trails at Hercules Glades have been re-named (2018), so we’ve switched out the map and links to ones that show the new trail names. We’ve got a load of GPS data giving fire ring locations and other points of interest: springs, stock ponds, old buildings etc… which we’ll be publishing at some point. Link: Downloadable / printable version. This trip requires a lot of bushwhacking — there are no trails to the bluffs. Hercules Glades – Beaver Creek Bluffs. Bushwhacking Required. Hercules Glades can is easily accessible from both Springfield and Branson Missouri, by taking Highway 65. From Highway 65 take Highway 160 east through Forsyth. Stop and enjoy some of the very nice views of Lake Taneycomo along the way. 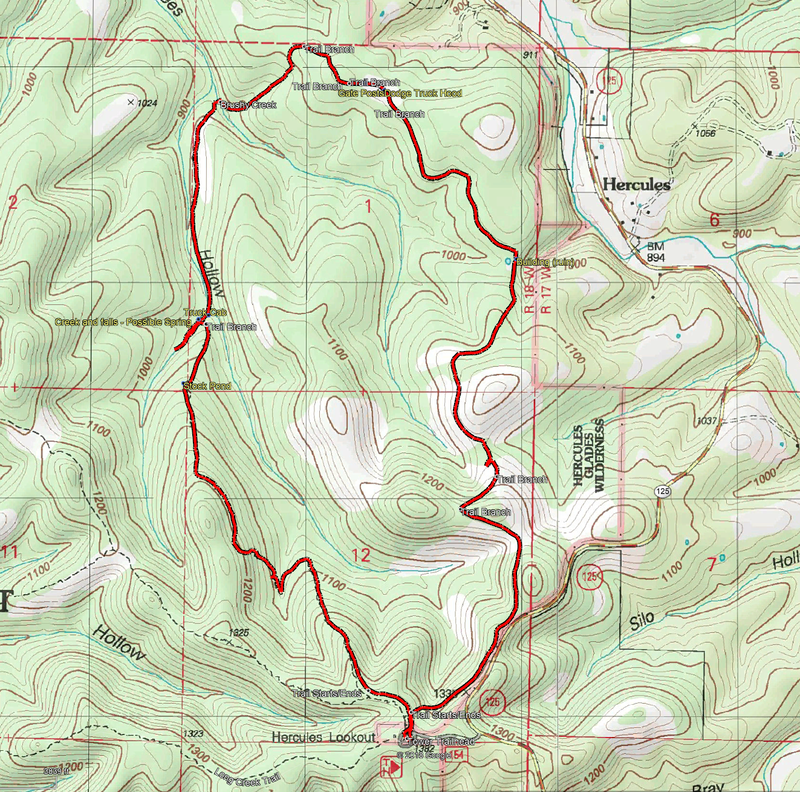 The Coy Bald trailhead is on Cross Timber Road, 19.4 miles along Highway 160 from Highway 65. The unpaved road can get rough, so check your ground clearance. At our last visit the road had been recently regraded and the road was fairly easy going after the first couple of turns. Traveling East on Highway 160, Cross Timber Road which leads to the Hercules Glades Wilderness Coy Bald Trailhead. You can see it on Google Street View below. The paved road ends at a ford. Do check the depth before crossing and remember that a sudden storm may trap you on the wrong side of the ford. Looking north at the start of the unpaved track to the Coy Bald Trail head. Immediately after crossing Cane Creek. Go right and follow the road up the hill. Looking south at the start of the paved section of Cross Timber Road leading to Highway 160. Check the depth of the ford before crossing and remember that a sudden storm may trap you on the wrong side of the ford.